The Royal Botanic Gardens, Kew, usually referred to as Kew Gardens, comprises 121 hectares of gardens and botanical glasshouses between Richmond and Kew in southwest London, England. "The Royal Botanic Gardens, Kew" and the brand name "Kew" are also used as umbrella terms for the institution that runs both the gardens at Kew and Wakehurst Place gardens in Sussex. The Royal Botanic Gardens, Kew, a non-departmental public body sponsored by the Department for Environment, Food and Rural Affairs, is an internationally important botanical research and education institution with 700 staff and an income of 56 million pounds for the year ended 31 March 2008, as well as a visitor attraction receiving almost two million visits in that year. Created in 1759, the gardens celebrated their 250th anniversary in 2009. 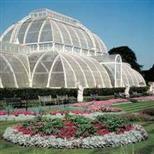 The director of the Royal Botanic Gardens, Kew, is responsible for the world's largest collection of living plants. The organisation employs more than 650 scientists and other staff. The living collections include more than 30,000 different kinds of plants, while the herbarium, which is one of the largest in the world, has over seven million preserved plant specimens. The library contains more than 750,000 volumes, and the illustrations collection contains more than 175,000 prints and drawings of plants. The Kew site includes four Grade I listed buildings and 36 Grade II listed structures in an internationally significant landscape. Kew Gardens Station (District Line (Richmond branch), London Overground) is the closest London Underground station, and is in zone 3. From Kew Gardens Station it is a 5 minute walk to Kew Gardens (Victoria Gate entrance). Exit the station past the parade of shops, cross Sandycombe Road and walk down Lichfield road (opposite) to reach Victoria Gate. Train services (South West Trains) from Waterloo, via Vauxhall and Clapham Junction, stop at Kew Bridge station. From Kew Bridge station it is a 10-minute walk to Kew Gardens (Elizabeth Gate entrance). Route 65 stops close to the entrance gates. Route 391 stops near Kew Gardens Station. Routes 237 and 267 stop at Kew Bridge station. The Kew Gardens car park (TW9 3AF) is near the Brentford Gate, which is reached via Ferry Lane, a narrow turning off Kew Green. Please note that parking is limited: the car park takes 300 cars. The Parking fee is 6 pounds 50 pence for the day. There is no charge for motorcycles and mopeds. The car park closes half an hour after the Gardens close. Free parking is also available on Kew Road (A307) after 10am every day. From here the nearest entrance is Victoria Gate. This road is congested at peak times, so it may be easier to come via public transport. Please note that parking restrictions apply on most of the residential streets around Kew and on parts of Kew Road, please check parking restrictions carefully. Guide dogs or registered disability assistance dogs are all welcome. Please ask for water at any of the catering outlets. We regret that other dogs are not allowed in the Gardens.